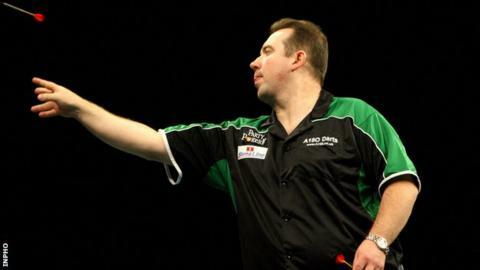 Fermanagh man Brendan Dolan, the number 11 seed, heads the Northern Ireland challenge at the PDC World Darts Championship at Alexandra Palace. Dolan, 41, faces South African Nolan Arendse or Alex Hon of Hong Kong in his opening match on Monday night. The 2011 World Grand Prix runner-up lost 4-1 to Gary Anderson in the second round last year, having lost at the same stage in 2010, 2011 and 2013. Londonderry man Daryl Gurney lost 3-1 to Ronnie Baxter in the second round. The 28-year-old, ranked 60 in the PDC rankings, bowed out to the former BDO world finalist after earlier beating Scott Mackenzie from Hong Kong 4-3 in the first round earlier on Saturday. Gurney fought back from 3-0 down to claim a 4-3 preliminary-round victory against Mackenzie then found Baxter too tough a proposition later in the day. Derryman Gurney pushed his opponent throughout but Baxter demonstrated his class when it mattered and sealed victory with a superb 12-darter including a 180 and a 104 finish. On Sunday, Michael Mansell from Clonoe, Tyrone, will play Belgian 18th seed Kim Huybrechts at 19:10 GMT. Mansell, 41, is currently ranked 42 in the world. Belcoo man Dolan is aiming to move beyond the second round for the first time, having played in the tournament since 2009.